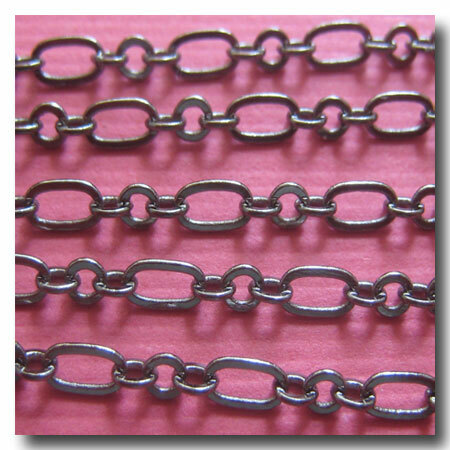 GUNMETAL ROMANTIC STYLE CHAIN. FINISH: Gunmetal. BASE: Brass base. STYLE: Main link connected to three small links. WEIGHT: Light. DIMENSIONS: Pattern length 8mm x 2.5mm. Also AVAILABLE in: Gold Plate 1-118, Silver Plate 1-298, Brushed Silver Plate 1-264, Antique Brass 1-080, Antique Copper 1-189 and Black 1-203.